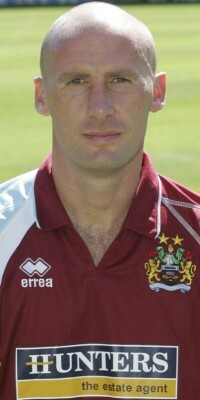 On Thursday 3rd June 2004, Steve Cotterill was appointed manager of Burnley Football Club. He spoke that day of the need to get new players in and said he had plans to speak to a player the following day. One day later I received a phone call from a friend of mine telling me he'd just seen Ipswich Town central defender John McGreal arriving at the ground. Some quick research showed that the former Tranmere defender was out of contract at Portman Road and was possibly looking for a new challenge. Two and two were put together, and for once it equalled four. Just one week after becoming manager Cotterill made his first signing - John McGreal. We snatched him from under the nose of Joe Royle just a year after he'd done the same to us when he signed Drissa Diallo. Birkenhead born John McGreal started his career as a youngster with his local club Tranmere Rovers and went on to play over 200 games for them before making the move to Ipswich in the summer of 1999 for a £650,000 fee. He joined an Ipswich side that had just failed to reach the Premiership, losing to Bolton in the play off semi-finals. A year later he was in their side that beat Barnsley at Wembley and in August 2000 John McGreal made his first Premiership start in a 2-1 win at Elland Road. Jermaine Wright scored the winner that day for Ipswich and he would score again the next time McGreal was in a winning team at Leeds. He had just past his 32nd birthday when he signed a three year deal with the Clarets, the same length of deal the manager had signed just a week earlier. I knew our new signing was a very good defender and I also recalled out 2002/03 visit to Ipswich when he opened the scoring, although to be fair a quick check at his stats suggested he was hardly a prolific scorer. The only downside to follow the news was suggestions coming from Suffolk that he struggled with injuries and wouldn't play too often for us. The fact was that he'd been ruled out for a time following a back injury but all looked to be fine with him and he'd been back in their side for some months. When I first spoke to the manager he told me that this was the calibre of player he was trying to bring in. I'd been impressed with this first signing but to be honest I'd underestimated him. Johnny Mac was soon showing me that he was an even better defender than I'd thought. At the start of that first season he formed a partnership with another new signing and another very experienced player in Frank Sinclair. They had come into a Burnley side that had gained a reputation for giving away goals far too easily and they went on to change that perception with some outstanding displays. Frank might have been considered reckless at times, over committed, but alongside him McGreal was calm, cultured, a real quality defender and it was hardly a surprise with him in the side that we were able to keep so many clean sheets. They complimented each other superbly as Cotterill's Burnley got off to a good start. I can still recall his performance at Leeds in that 2-1 win. It was a side ravaged by injury that saw us playing with full backs here there and everywhere, but at the back McGreal was simply majestic despite suffering an injury during the game. He finally succumbed and had to be replaced. The standing ovation from the away end was sincere and so well deserved. I think it was that night that we first heard the chants of 'Super, super John'. Yes, he missed games through injury, and he occasionally made mistakes although it has to be said he made very few. The whole ground was stunned when he gave away a goal against his former club Ipswich, in what was around his twentieth game for the Clarets it was the first time he'd ever come close to costing us a goal. With him and Frank both missing occasional games we brought in youngster Gary Cahill from Aston Villa on loan and his pairing with the youngster simply went from strength to strength. We knew we'd got a good young player with us, but I'm sure equally Cahill was aware just how good the player was alongside him. The two of them won the most man of the match awards that season on Clarets Mad. It was much the same for much of his second season, top performance after top performance. I recall going to Wolves when he was considered doubtful but he played. He was injured again and looked certain to come off, he stayed on the pitch. When I saw the re-run on TV I couldn't believe the state of his ankle. He didn't just play on it, he turned in yet another superb performance as we won away from home for the first time in ages. I can hardly remember a disappointing performance, but he did lose his place in the side towards the end of the season following an injury, and it was injuries that sadly took their toll during his last season with the Clarets. He was out of the side at the beginning of the season, and each time he established himself back in the side he would lose his place again through injury. He twice started eight successive games, but he played in less than half of our games during the season. When he played, and when he was fit, it was the same cultured defender we'd always seen. On a miserable Tuesday night in March we travelled to Southend where we suffered a devastating defeat. Johnny Mac came off injured after only seven minutes to be replaced by Stephen Foster. The change prompted discussion in the away stand, concern that our defence didn't look quite so secure without him. We couldn't have known that his Burnley career had just come to an end. If I, or in fact if any of the Burnley fans there that night, had known he would have received a standing ovation as he left the pitch. Cotterill's first signing had just played his last game for Burnley and at the end of the season it was hardly a surprise when it was announced that he wouldn't be offered a new contract. Many keen Clarets have described him as the best defender they've seen play for the club, and it is difficult to argue with that. I've lost count of the many times I've heard said: "I wish he'd signed for us ten years earlier." That's how highly he was rated by the fans. It wasn't just the fans either. On letting him go, Steve Cotterill said of him: "John was my first signing and I'll never forget that one. He was very important, not only as a player, but in enabling me to sign other players on the back of him. "I look back on that signing with great fondness because John has since been an excellent player for me. I just felt that with time not on John's side, we needed to try to make us younger. But John has been magnificent and I would like to thank him very much for his services." It brought an end to his playing career. He did have a trial with Colchester but wasn't offered a deal by manager Geraint Williams, but that was the club where he returned to football as a coach of one of the junior teams. Ahead of the 2014/15 season he was promoted to manage the development squad and on 26th November 2015 he stepped up to work with the first team following the departure of manager Tony Humes.